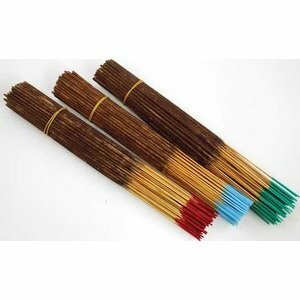 Imbued with the sweetness of Coconut and an earthy undertone that brings balance to the scent, Black Coconut stick incense from Auric Blends is a delightful addition to any room or sacred space. Burn it to fill the air with a fragrant smoke that is almost confectionary in the sweet delight that it brings to mind and spirit. Each pack contains approximately 90 - 95 sticks of handcrafted, alcohol and charcoal free, incense from Auric Blends.